We offer solution to the safety concerns by making available robust and stylish White Metal Door Handles. These White Metal Door Handles do not break easily and also prevent the risk of tampering. Along with adding to the safety aspect, they also provide an aesthetic look to the doors. Brass designer crown shape handle. 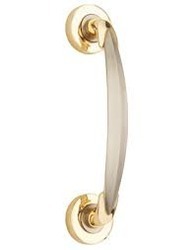 Avail from us, well-designed Brass Door Handles. These Brass Door Handles are manufactured from high-grade brass and therefore they ensure high quality. The designs of our Brass Door Handles are highly attractive and they are widely appreciated by our clients. We offer these Brass Door Handles at market leading prices. We have gained specialization in manufacturing and offering a large array of Brass Furniture Handle. These are made using high quality raw materials and state-of-the-art facilities to ensure high tensile strength and durability standards. To suit the specific requirements of our clients, we offer the Brass Furniture Handles in different sizes.